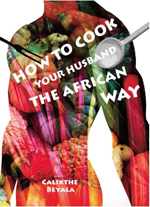 The story of a woman who falls in love with her neighbour,and remembering her mother’s wisdom and the traditions of Africa, sets out to cook her way to his heart. A charming story interspersed with delicious recipes that punctuate each chapter. Calixthe Beyala was born in Cameroon and moved to France in 1978. A prolific novelist, she has won numerous awards. She is married with two children. Great story line with the added bonus of some interesting recipes.